Indicates the speed of your submarine in knots (kn), the value is positive (e.g. 18 kn) when the submarine is moving forward, it is negative (e.g. -12 kn) when it moves back, null (0 kn) when it is stationary. The maximum speed is +18 kn (forward) or -12 kn (backwards) at surface, +8 kn (forward) or -5 kn (backwards) at periscope depth or submerged. If the submarine is damaged, the maximum speed is reduced, with severe damage it is impossible to move ! The speed indicator is GREEN when your submarine is not damaged and can proceed at its maximum speed; it is YELLOW when your submarine is damaged and its maximum speed is limited; it is RED when your submarine is severely damaged and can not move ! Near the “Speed” text, the symbol [<],[=],[>] indicates when your speed is decreasing, stable or increasing. 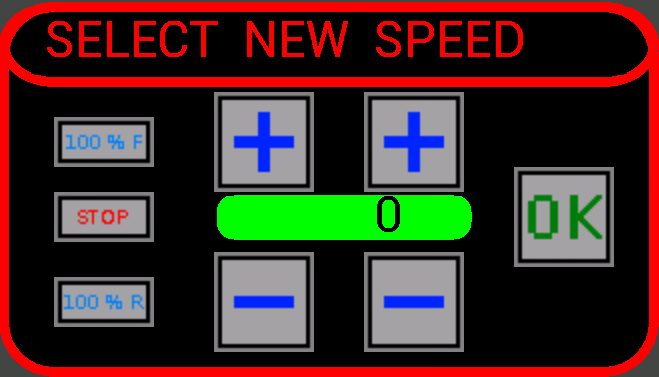 The green box indicates the desired speed, you can change it using the buttons + and – to increase or decrease the tens and units of the knots, or set it quickly with the 3 buttons on the left (100% F = forward maximum, STOP = stationary, 100% R = backwards maximum). When finished, press the OK button to close the window and the speed will gradually change until it reaches the desired one (remember to press the PLAY button if the game is paused). For example it is 0° when you go to the North (towards the top of the map), 90° when you go to the East (to the right on the map), 180° when you go to South (down on the map), 270° when you go to West (to the left on the map). The submarine can not rotate when stationary, it must have a minimum speed forward or backwards, and its rotation can be slow if the submarine speed is low or if it is damaged ! The course indicator is GREEN when your submarine is not damaged and can change its course; it is YELLOW when your submarine is damaged and its steering speed is limited; it is RED when your submarine is severely damaged and can not steer ! Near the “Course” text, the symbol [<],[=],[>] indicates when your course is decreasing, stable or increasing. The green box indicates the desired course, you can change it using the buttons + and – to increase or decrease the hundreds, tens and units of degrees, or set it quickly with the 4 buttons on the left (N = North, E = East, S = South, W = West). The blue arrow gives an immediate indication of what will be the new course. When finished, press the OK button to close the window and the course will gradually change until it reaches the desired one. A depth of 0 m indicates that the submarine is at surface, a depth of 8 m indicates it is at periscope depth, the maximum safe depth is 250 m.
The background changes from green to yellow to red depending on the depth. Caution: always remain in the safe area between 0 and 250 m (green), because in the area between 250 and 300 m (yellow) the submarine receives damage with the passage of time, over 300 m (red) the submarine implodes and the game ends immediately ! It indicates also the status of the periscope (Raised [P] or Lowered [b]). Near the “Depth” text, the symbol [<],[=],[>] indicates when your depth is decreasing, stable or increasing. This window is divided in two parts, on the left there are the two buttons to raise or lower the periscope, on the right there are the buttons to change the depth of the submarine. The green box indicates the desired depth (000), you can change it using the buttons + and – to increase or decrease the hundreds, tens and units of meters, or set it quickly with the 3 buttons on the left (Surface = 0 m, Perisc. = periscope = 8 m, MAX = maximum safe depth = 250 m). If you try to increase the depth beyond 250 m the background changes from green to yellow, above 300 m the background turns red. When finished, press the OK button to close the window and the depth will gradually change until it reaches the desired one. As for the course, the submarine will change its depth fastly if it is moving forward or backwards; if the submarine is stationary then its depth will change very slowly. Note: When the submarine is at periscope depth (8 m) and the periscope is raised [P], the U-Boat can see the other units, and the other units can see the periscope with their sight and detect it with their radar. When the submarine is at periscope depth (8 m) and the periscope is lowered [b], the U-Boat can not see the other units, and the other units can not detect it with their sight and radar. A health of 100% indicates that the submarine has no damage, a health of 0% that it is completely destroyed and the game is over. The indicator is normally green, but turns yellow with health below 50 % and red with health below 25 %. Near the “Health” text, the symbol [<],[=],[>] indicates when your health is decreasing, stable or increasing. The submarine is located at a depth between 250 and 300 m, with the passage of time will be damaged because the water pressure is too high (over 300 m it implodes immediately!). It is advisable to always remain at a depth between 0 and 250 m.
The submarine at surface (0 m) or periscope depth (8 m) collides with another ship, and become damaged (big or little damage, depending on the speed of the collision). The submarine at surface is attacked with gunfire by an enemy warship. The range of the guns of enemies is variable, you should not get too close to an enemy warship when you are at surface. The submarine at surface (or periscope depth with the periscope raised) is attacked with gunfire by an enemy airplane. In this case, it is better to dive below periscope depth (or at periscope depth but keeping the periscope lowered). The submerged submarine is hit by a depth charge and become damaged (big or little damage, depending on the distance from the explosion). When an enemy warship launches depth charges, it is advisable to move away and increase the submarine depth. The submarine is able to automatically repair its damage (only in the Full version of the game) remaining at a depth between 0 and 250 m, but once damaged its health never rises above 75%, thus preventing the navigation at maximum speed. If the submarine is damaged and is located in the safe depth (between 0 and 250 m), the damage will be repaired automatically and its health will grow. If the submarine is between 8 m (periscope depth) and 250 m, its health will grow slowly up to 50%. If the submarine is at surface (0 m), its health will grow faster up to 75%. If your submarine is linked with the Torpedoes Transport (an other special submarine you can call with the radio, only in the Full version of the game), its health will grow faster up to 100%. IMPORTANT: if your submarine is submerged (between 8 and 250 m) and its health is below 25%, it will continue to get additional damage, and its health will slowly decrease up to 0% ! So if you have a lot of damage, it is better to go up at surface ! A charge of 100% indicates that the submarine is perfectly controllable, a charge of 0% that the submarine has a big problem, and can only change its depth (if the batteries are fully discharged, go up at surface to recharge them). The indicator is normally green, but becomes yellow with the charge under 50 %, and red with the charge under 25 %. The batteries are used both for the normal functioning of the submarine, for navigation with electric motors to periscope depth or underwater, and for its sensors. Staying stuck at periscope or submerged will discharge very slowly the batteries, instead navigating with the electric motors will discharge them faster (depending on the speed). The batteries are automatically recharged only by remaining at surface, does not matter whether stationary or moving, are recharged by diesel engines that can not operate underwater. The recharge is fast when the submarine is stationary, slow at slow speeds, no recharge at high speeds ! With fully charged batteries, the submarine can stay under the surface for about 320 hours standing stationary, for about 1.5 hours surfing with electric motors at maximum speed. Near the “Batt” text, the symbol [<<],[<],[=],[>],[>>] indicates when your batteries are discharging fastly or slowly, stable, recharging slowly or fastly. Note: the batteries can be recharged only in the full version of the game ! A percentage of 100% indicates that the crew is fully operational, a charge of 0% indicates that the reserve is empty, causing the death of the crew and the end of the game. The indicator is normally green, but turns yellow with the reserve below 50%, and red with the reserve below 25%. The oxygen reserve is reduced remaining at periscope (8 m) or submerged, will restore remaining at surface (0 m). With oxygen tanks filled the submarine can stay below the surface for about 72 hours. Near the “O2” text, the symbol [<],[=],[>] indicates when your O2 level is decreasing, stable or increasing. Note: the oxygen reserve can be recharged only in the full version of the game ! A percentage of 100% indicates that the tanks are full, a percentage of 0% that the tanks are empty. The indicator is normally green, but turn yellow with the reserve below 50%, and red with the reserve below 25%. The fuel is consumed when you navigate at surface with diesel engines, if fuel runs out the submarine can not navigate on the surface or recharge the batteries. With full fuel tanks the submarine can navigate at surface for about 8200 NM sailing at a speed of 10 kn, about 4500 NM sailing at full speed (18 kn). Near the “Fuel” text, the symbol [<],[=],[>] indicates when your fuel is decreasing, stable or increasing. Note: call the Torpedoes Transport to refuel your submarine. Note: the fuel reserve can be recharged only in the full version of the game ! Indicates the date and the current time (Date), they don’t change if the game is paused. The day is divided into Night (from 19 to 05), Sunrise (from 05 to 06), Day (from 06 to 18) and Sunset (from 18 to 19). Depending on the time of day the color of the map changes (from blue at day to gray at night) but also changes the distance at which the units are identified on sight. With the light of day this distance increases, it is reduced in the dark of the night, is what affects the ability of ships to see each other, to be seen when the submarine is at surface and see the enemy ships when the submarine is at surface or at periscope. This distance is 7.5 miles (7.5 NM) in the day, decreases during sunset, 2 miles (2 NM) at night and increase again during sunrise. Indicates the acceleration of time (Time Acc.) of the game, you need to speed up the game when you have to travel long distances or stay a long time waiting for the passage of a ship. To change the acceleration press the green square, at every touch the value will increase up to the maximum (to return to 1x press again). In the game the maximum value is 512x. Attention: values too high can lead to abnormal behavior of other units (collisions with land masses, convoys problems), it depends on the cpu speed of the smartphone and the frame rate that the game can guarantee … you can always choose the max time acceleration (512x), but the indicators becomes yellow or red to remember that some problems can arise.